Well done! You've just taken your first step to stop smoking. We provide specialised support to quit smoking at our stop smoking clinics based at various locations across the borough. All of the clinics below are drop-in clinics apart from Feltham clinic which has appointments from 1:00pm to 3:30pm followed by a drop-in clinic from 4pm to 6pm. If you would like to make an appointment at the Feltham clinic please call 020 8973 3530. We offer tools and support whether you prefer to quit by yourself or with the help of our friendly Stop Smoking Specialists. You are 4 x more likely to quit with our help. Sign the Smokefree Cars & Homes Promise! Over 80% of cigarette smoke is invisible. No matter how careful you are, children are at risk of breathing in harmful poisons from cigarettes. 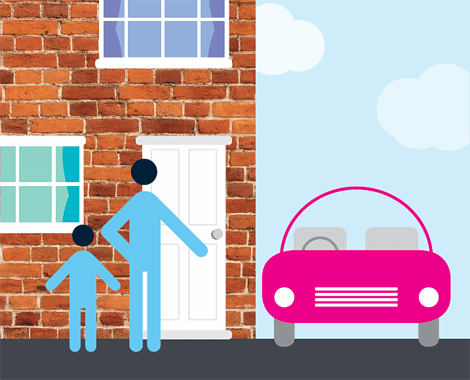 The best way to protect you and your family is to make your home and car smokefree. The Smokefree app can help you stop smoking by providing daily support and motivation. "It's all down to the centre, because without the centre and Lavina I wouldn't have stopped, without a doubt. It's what she does - she texts you, she's there for you and she listens." After nearly going blind as a result of a brain tumour, Stephen Little turned his life around thanks to his determination and One You Hounslow’s Stop Smoking Specialist Lavina. "I couldn't have done it on my own without the tablets and the help of my Stop Smoking advisor, Jess." Thanks to the support from our stop-smoking team, Lilie has been smoke-free for over 16 weeks. Can’t make one of the above clinic times?